Stoke City condemned Manchester United to a fourth straight defeat to increase the pressure on manager Louis van Gaal. Bojan Krkic broke the deadlock after a poor header back to David de Gea from Memphis Depay allowed Glen Johnson to play it back to the Spanish forward. Stoke went 2-0 ahead through Marko Arnautovic's 25-yard finish after Bojan's free-kick had hit the wall. Van Gaal dropped captain Wayne Rooney, who came on as a half-time substitute, and United struggled to create chances. Stoke were superior throughout and could have won by more. Arnautovic missed a great chance to add to United's misery when clean through, while Potters keeper Jack Butland denied Marouane Fellaini, Anthony Martial and Juan Mata. Van Gaal was already under pressure before kick-off after a poor run of form but the manner of United's defeat at the Britannia Stadium - together with the manager's decision to leave out England skipper Rooney - is bound to raise more questions about the Dutchman's future. United rarely looked like getting back into the game after falling behind and showed little desire and leadership as they found themselves outmuscled and outfought by an impressive Stoke side. They were already 2-0 behind after an awful first-half display when Rooney, starting on the bench in a league match for the first time since 28 January 2014, was introduced at the start of the second period. 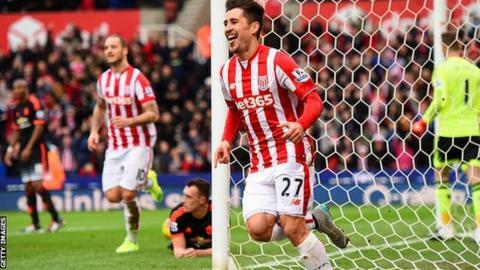 They improved after the break, but Stoke, managed by former United forward Mark Hughes, deserved their victory. United's lack of goals- seven in the past nine league games - has been well documented yet their latest downfall was caused by alarming mistakes at the back. Depay's intended header back to his keeper De Gea was far too short and Bojan made the visitors pay with a close-range finish in the 19th minute after Johnson seized on the error to set up the former Barcelona player. It was 2-0 seven minutes later when Bojan's free-kick rebounded off the wall and Arnautovic, who was quickest to react, produced a sublime finish from outside the area. United had hardly tested Butland when Austria international Arnautovic got the better of Phil Jones after a delightful pass from Bojan only to fire wide when clean through. The Britannia Stadium is fast becoming a graveyard for the Premier League's bigger clubs. Manchester City and Chelsea have both lost at the venue this season and victory over United was celebrated with just as much enthusiasm by the home fans. Make no mistake, the home side were worthy winners, with Bojan, Arnautovic and Xherdan Shaqiri causing Jones and Chris Smalling huge problems with their pace. How far can Hughes take the Potters? They started 2015 with a 1-1 draw over United at the Britannia. They're ending the calendar year within sight of a European place. There were several candidates in Stoke shirts but the Spaniard was a thorn in United's defence from start to finish - a real team player who showed desire on and off the ball. He now has two goals in two games. Stoke City manager Mark Hughes: "I thought we were excellent in the first half. We looked to be positive and tried to get in behind their back four. "They may have got some momentum but we saw it out quite comfortably. "We wanted to be on the front foot and force errors and that's what happened. "We have got players who can take chances but they might have taken more this season." Manchester United manager Louis van Gaal: "We have lost the game in the first 45 minutes because we didn't dare to play our football. Former Everton winger Kevin Kilbane, speaking on Final Score: "I can't see Louis van Gaal staying beyond this now. On Tuesday he walked out of his press conference, and there has been an awful lot of pressure on him this week. Marko Arnautovic has now scored more Premier League goals this season (six) than his previous two combined (five). The last time Manchester United lost four competitive games in a row was between May and August 2001. United have lost four straight competitive matches in a single season for the first time since November 1961. United lost a Premier League game on Boxing Day for the first time since 2002 (1-3 at Middlesbrough) and only for the second time overall in the top flight (P22 W18 D2 L2). Louis van Gaal's side have averaged just 1.22 goals per game in the league this season (22 goals in 18 games) - United's lowest average in a league campaign since 1989-90 (1.21). Stoke have kept a clean sheet in eight of their past 11 Premier League games. Both teams have little time before they are back in action. While Stoke make the journey to face Everton (15:00 GMT) on Monday, United entertain Chelsea (17:30 GMT) at Old Trafford. Match ends, Stoke City 2, Manchester United 0. Second Half ends, Stoke City 2, Manchester United 0. Corner, Manchester United. Conceded by Jack Butland. Attempt saved. Juan Mata (Manchester United) right footed shot from the centre of the box is saved in the top right corner. Assisted by Wayne Rooney. Attempt saved. Bojan (Stoke City) right footed shot from outside the box is saved in the bottom left corner. Assisted by Charlie Adam. Attempt saved. Anthony Martial (Manchester United) right footed shot from outside the box is saved in the bottom right corner. Assisted by Andreas Pereira. Attempt missed. Charlie Adam (Stoke City) left footed shot from more than 35 yards is just a bit too high from a direct free kick. Attempt missed. Charlie Adam (Stoke City) left footed shot from outside the box is too high from a direct free kick. Attempt missed. Ibrahim Afellay (Stoke City) right footed shot from outside the box is high and wide to the right. Assisted by Bojan. Attempt missed. Ibrahim Afellay (Stoke City) right footed shot from outside the box misses to the right. Assisted by Mame Biram Diouf. Attempt saved. Marouane Fellaini (Manchester United) right footed shot from the centre of the box is saved in the centre of the goal. Assisted by Wayne Rooney.